The Johnson City, NY area has had 5 reports of on-the-ground hail by trained spotters, and has been under severe weather warnings 44 times during the past 12 months. 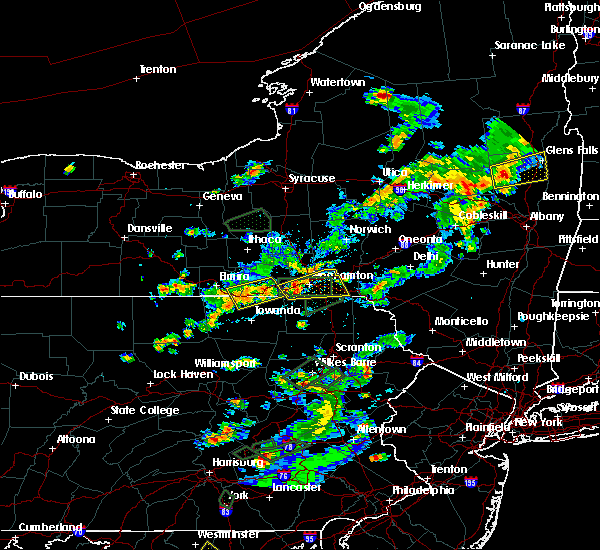 Doppler radar has detected hail at or near Johnson City, NY on 20 occasions. 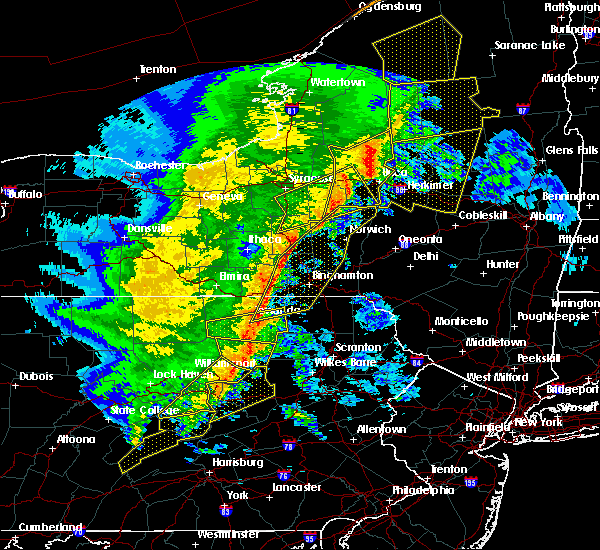 4/15/2019 1:27 AM EDT At 127 am edt, severe thunderstorms were located along a line extending from chenango forks to near friendsville to near auburn center, moving east at 45 mph (radar indicated). Hazards include 70 mph wind gusts. Expect considerable tree damage. damage is likely to mobile homes, roofs, and outbuildings. Locations impacted include, binghamton, vestal, johnson city, endicott, kirkwood, conklin, rush, sidney, jackson and guilford. 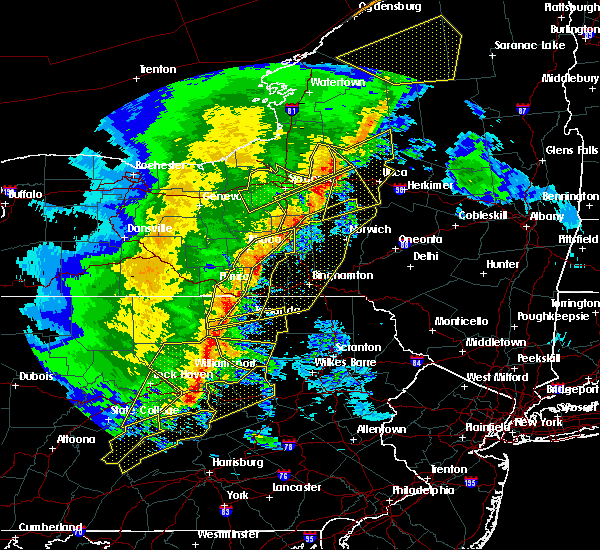 4/15/2019 1:10 AM EDT At 110 am edt, severe thunderstorms were located along a line extending from near nanticoke to near le raysville to near new albany, moving east at 45 mph (radar indicated). Hazards include 70 mph wind gusts. Expect considerable tree damage. Damage is likely to mobile homes, roofs, and outbuildings. 4/15/2019 12:54 AM EDT At 1254 am edt, severe thunderstorms were located along a line extending from near newark valley to near north towanda to near lincoln falls, moving northeast at 60 mph (radar indicated). Hazards include 60 mph wind gusts. Expect damage to roofs, siding, and trees. Locations impacted include, binghamton, vestal, johnson city, endicott, barton, sayre, maine, owego, athens and towanda. 4/15/2019 12:40 AM EDT At 1240 am edt, severe thunderstorms were located along a line extending from near lockwood to near shunk, moving northeast at 55 mph (radar indicated). Hazards include 60 mph wind gusts. Expect damage to roofs, siding, and trees. Locations impacted include, chemung, binghamton, vestal, johnson city, endicott, barton, sayre, maine, waverly and owego. 8/29/2018 9:34 PM EDT At 934 pm edt, severe thunderstorms were located along a line extending from near danby to near tioga center to litchfield, moving east at 40 mph (radar indicated). Hazards include 60 mph wind gusts. Expect damage to roofs, siding, and trees. 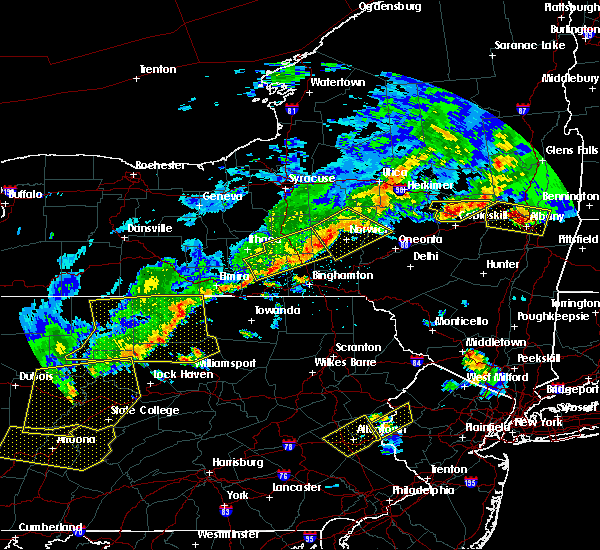 severe thunderstorms will be near, owego around 940 pm edt. slaterville springs around 945 pm edt. caroline and newark valley around 950 pm edt. berkshire, richford and union center around 955 pm edt. tioga terrace and endwell around 1000 pm edt. 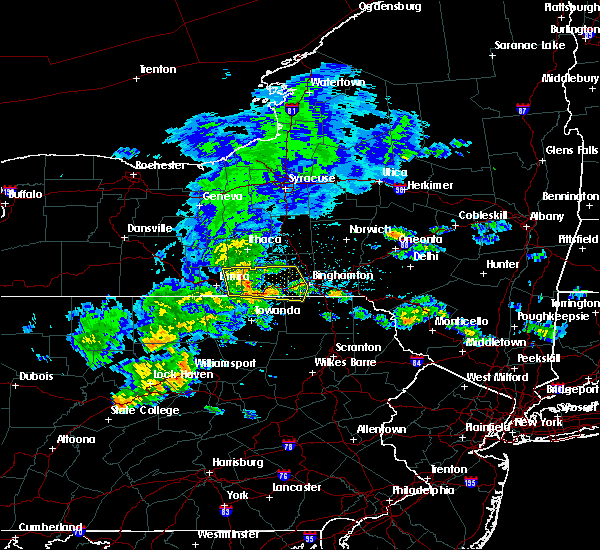 johnson city, endicott and greater binghamton airport around 1005 pm edt. marathon, whitney point and lisle around 1010 pm edt. 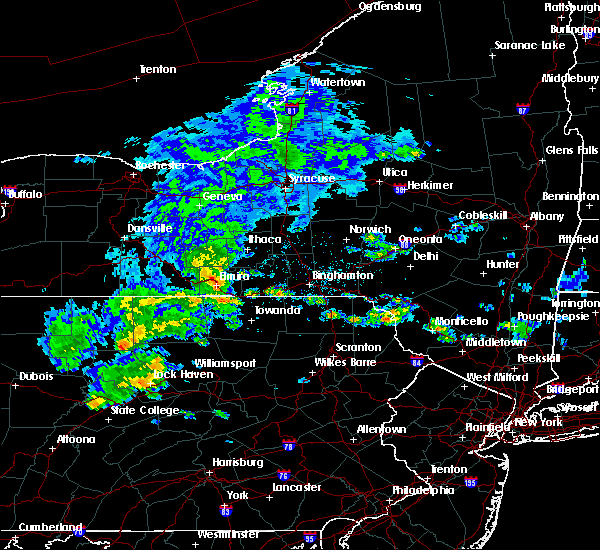 Chenango forks around 1015 pm edt. 7/2/2018 7:46 PM EDT At 743 pm edt, severe thunderstorms were located along a line extending from near greene to near castle creek to near greater binghamton airport to vestal, moving east at 30 mph (radar indicated). Hazards include 60 mph wind gusts and nickel size hail. Expect damage to roofs, siding, and trees. Locations impacted include, binghamton, vestal, johnson city, endicott, kirkwood, conklin, maine, guilford, nanticoke and coventry. 7/2/2018 7:26 PM EDT At 723 pm edt, severe thunderstorms were located along a line extending from lisle to near nanticoke to near newark valley to near owego. another line of severe thunderstorms extended between oxford and belden. all of the thunderstorms were moving east at 30 mph (law enforcement. 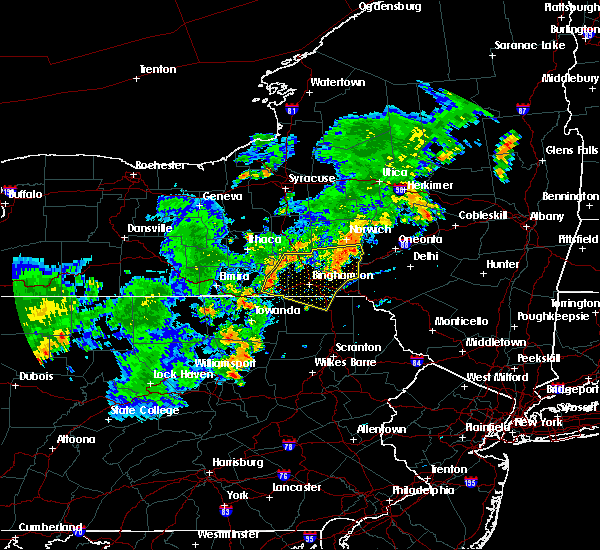 trees and powerlines have been reported blown down in eastern tioga county in association with these thunderstorms). Hazards include 60 mph wind gusts and nickel size hail. Expect damage to roofs, siding, and trees. Locations impacted include, binghamton, vestal, johnson city, endicott, kirkwood, conklin, maine, owego, guilford and nanticoke. 7/2/2018 6:46 PM EDT At 644 pm edt, severe thunderstorms were located along a line extending from near lisle to near whitney point to greater binghamton airport. 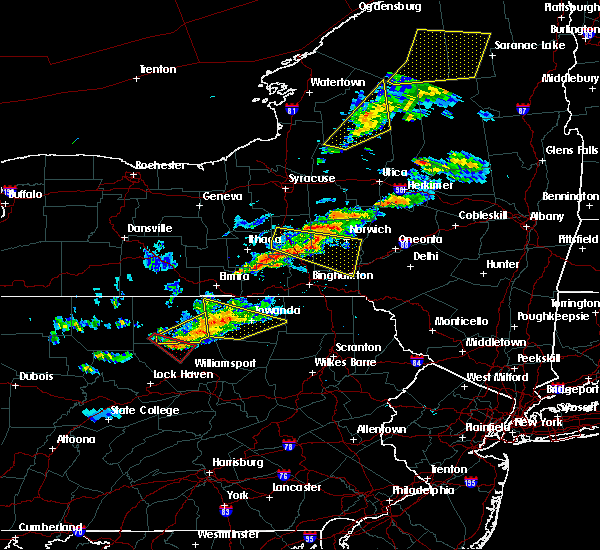 additional severe thunderstorms were located over southwestern chenango county, between greene and smithville center. all of the thunderstorms were moving northeast at 25 mph (radar indicated). Hazards include 60 mph wind gusts and quarter size hail. Hail damage to vehicles is expected. expect wind damage to roofs, siding, and trees. Locations impacted include, binghamton, johnson city, endicott, maine, nanticoke, coventry, port dickinson, greene, oxford and whitney point. 7/2/2018 6:25 PM EDT At 625 pm edt, severe thunderstorms were located along a line extending from near nanticoke to near newark valley to near union center, moving northeast at 25 mph (radar indicated). Hazards include 60 mph wind gusts and quarter size hail. Hail damage to vehicles is expected. Expect wind damage to roofs, siding, and trees. 6/18/2018 8:20 PM EDT At 817 pm edt, severe thunderstorms were located along a line extending from richford to near candor, moving east at 45 mph (radar indicated). Hazards include 60 mph wind gusts. Expect damage to roofs, siding, and trees. 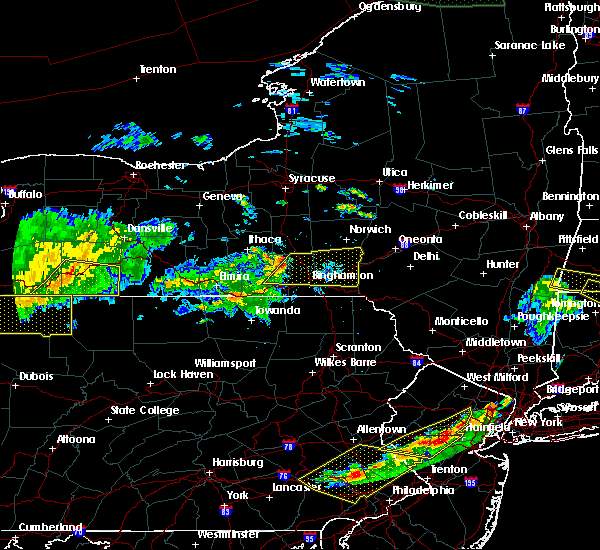 severe thunderstorms will be near, nanticoke around 825 pm edt. newark valley, whitney point and lisle around 830 pm edt. endicott, union center and west corners around 835 pm edt. 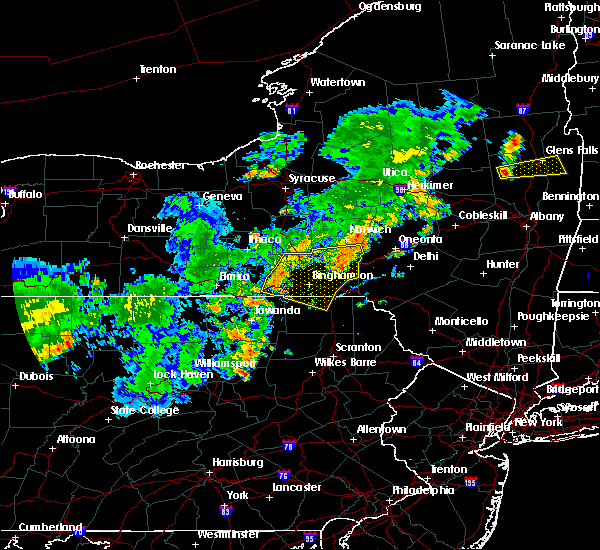 johnson city, greater binghamton airport and endwell around 840 pm edt. binghamton, greene and castle creek around 845 pm edt. brisben, chenango forks and chenango bridge around 850 pm edt. coventry, oxford and south oxford around 855 pm edt. Guilford, bainbridge and harpursville around 900 pm edt. 6/13/2018 9:40 PM EDT The severe thunderstorm warning for southwestern otsego, southern broome, northwestern delaware and southeastern chenango counties will expire at 945 pm edt, the storms which prompted the warning have moved out of the area. therefore, the warning will be allowed to expire. a severe thunderstorm watch remains in effect until 1100 pm edt for central new york. 6/13/2018 9:07 PM EDT At 907 pm edt, severe thunderstorms were located along a line extending from near franklin to near brackney, moving southeast at 40 mph (several reports of downed trees and wires along this line of storms). Hazards include 60 mph wind gusts. Expect damage to roofs, siding, and trees. these severe storms will be near, otego, franklin and east sidney around 910 pm edt. Meredith and meridale around 920 pm edt. 6/13/2018 8:57 PM EDT The severe thunderstorm warning for northwestern broome, east central tioga and southwestern chenango counties will expire at 900 pm edt, the storms which prompted the warning have moved out of the area. therefore, the warning will be allowed to expire. 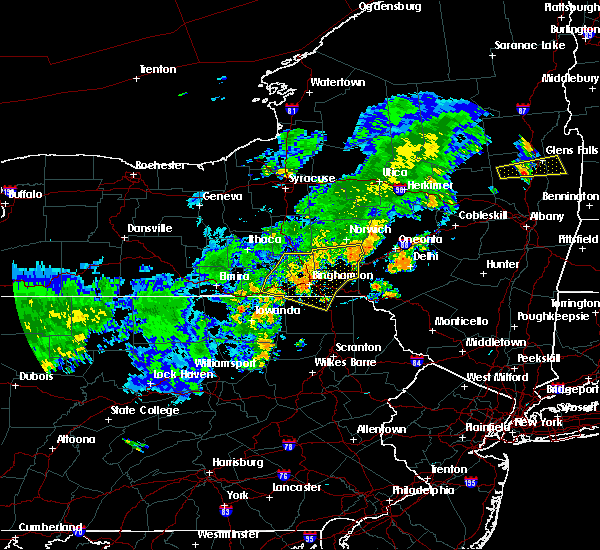 a severe thunderstorm watch remains in effect until 1100 pm edt for central new york. 6/13/2018 8:46 PM EDT At 846 pm edt, severe thunderstorms were located along a line extending from mt upton to near west corners, moving southeast at 40 mph (radar indicated). Hazards include 60 mph wind gusts. Expect damage to roofs, siding, and trees. severe thunderstorms will be near, sidney, guilford and gilbertsville around 850 pm edt. unadilla around 855 pm edt. binghamton, otego and east sidney around 900 pm edt. franklin around 905 pm edt. meridale around 915 pm edt. Meredith around 920 pm edt. 6/13/2018 8:35 PM EDT At 834 pm edt, severe thunderstorms were located along a line extending from near mc donough to near newark valley, moving east at 45 mph (trained weather spotter reported a tree down in broome county). Hazards include 60 mph wind gusts. Expect damage to roofs, siding, and trees. these severe storms will be near, whitney point, union center and endwell around 850 pm edt. johnson city and greater binghamton airport around 855 pm edt. Chenango forks, castle creek and chenango bridge around 900 pm edt. 6/13/2018 8:10 PM EDT At 809 pm edt, severe thunderstorms were located along a line extending from near virgil to near van etten, moving east at 45 mph. several reports of downed trees have occurred with this cluster of storms (radar indicated). Hazards include 60 mph wind gusts. Expect damage to roofs, siding, and trees. 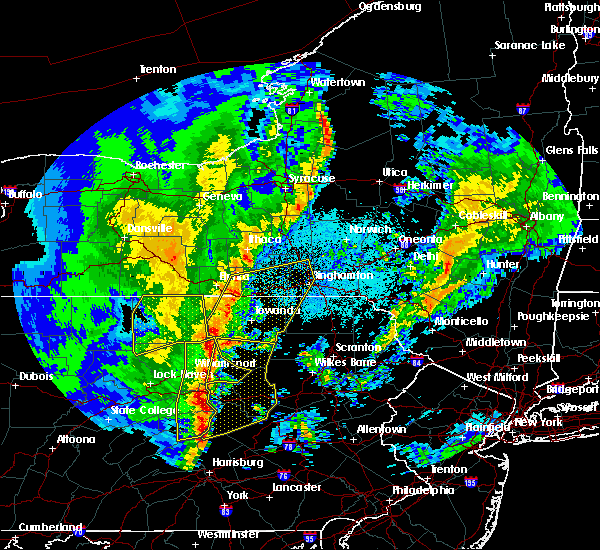 severe thunderstorms will be near, marathon around 815 pm edt. candor around 825 pm edt. richford around 835 pm edt. 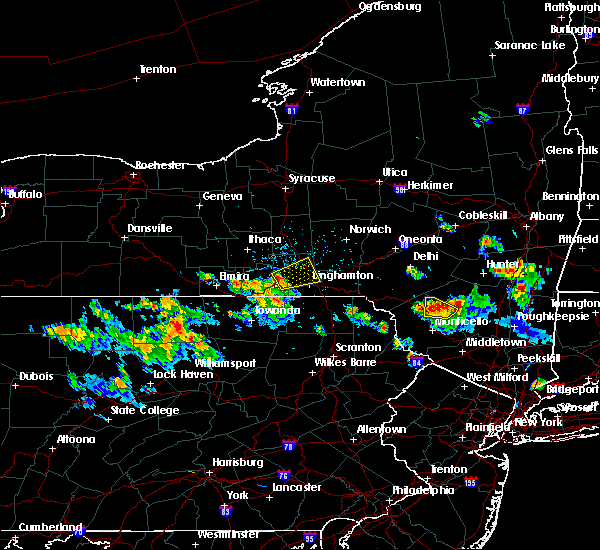 berkshire and newark valley around 840 pm edt. nanticoke around 845 pm edt. endicott, whitney point and union center around 850 pm edt. johnson city, greater binghamton airport and castle creek around 855 pm edt. Chenango forks and chenango bridge around 900 pm edt. 5/28/2018 4:13 PM EDT At 412 pm edt, a severe thunderstorm was located over newark valley, or 8 miles northeast of owego, moving southeast at 25 mph (radar indicated). Hazards include ping pong ball size hail and 60 mph wind gusts. People and animals outdoors will be injured. expect hail damage to roofs, siding, windows, and vehicles. expect wind damage to roofs, siding, and trees. 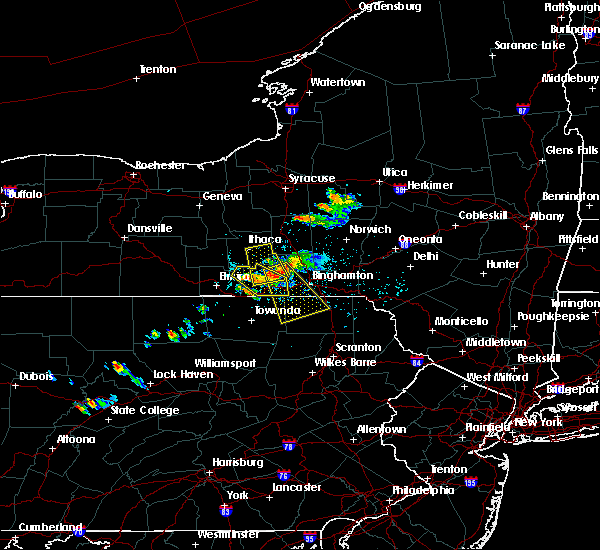 this severe thunderstorm will be near, owego around 425 pm edt. union center around 430 pm edt. johnson city, endicott and apalachin around 435 pm edt. vestal around 440 pm edt. tioga terrace around 445 pm edt. little meadows and vestal center around 450 pm edt. warren center around 500 pm edt. Friendsville and brackney around 505 pm edt. 5/4/2018 7:06 PM EDT At 703 pm edt, severe thunderstorms were located along a line extending from bridgewater to columbus to near oxford to near apalachin, moving southeast at 40 mph (radar indicated). Hazards include 70 mph wind gusts. Expect considerable tree damage. damage is likely to mobile homes, roofs, and outbuildings. severe thunderstorms will be near, norwich, oxford and new berlin around 710 pm edt. guilford, edmeston and pittsfield around 715 pm edt. richfield springs, morris and exeter center around 720 pm edt. sidney, gilbertsville and brackney around 725 pm edt. 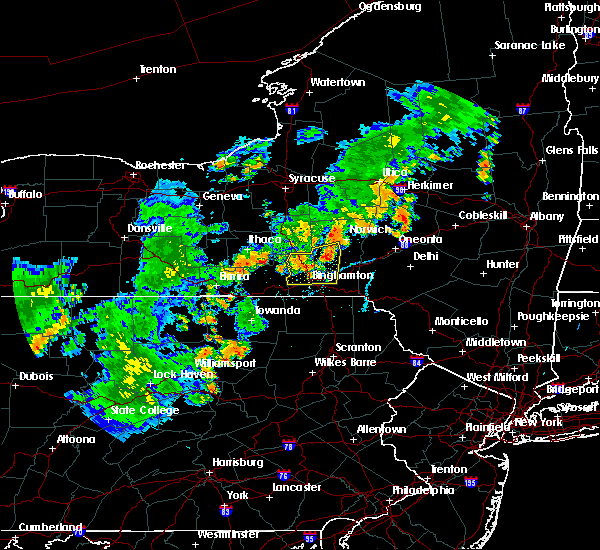 cooperstown, conklin and hartwick around 730 pm edt. oneonta, kirkwood and otego around 735 pm edt. middlefield, hallstead and great bend around 740 pm edt. maryland, new milford and elk creek around 745 pm edt. 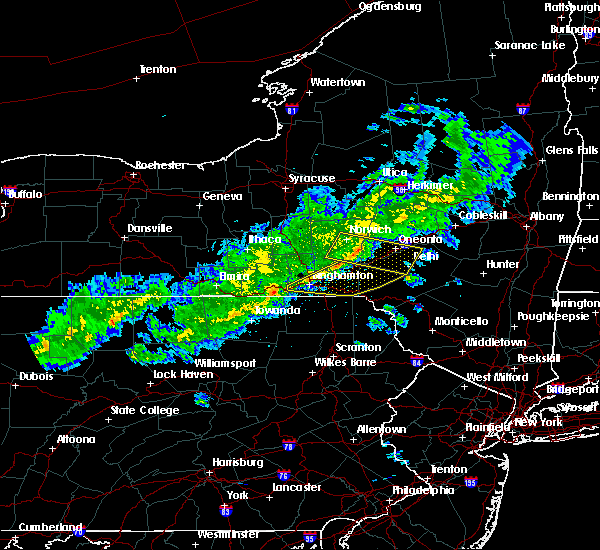 A severe thunderstorm watch remains in effect until 900 pm edt for central new york. 5/4/2018 6:49 PM EDT At 647 pm edt, severe thunderstorms were located along a line extending from near waterville to near earlville to near pitcher to near candor, moving southeast at 40 mph (radar indicated). Hazards include 60 mph wind gusts. Expect damage to trees, and power lines. these severe storms will be near, hamilton, waterville and lebanon around 650 pm edt. plymouth, sherburne and clayville around 655 pm edt. brookfield, north norwich and bridgewater around 700 pm edt. norwich, oxford and columbus around 705 pm edt. endicott, greater binghamton airport and vestal around 710 pm edt. johnson city, guilford and pittsfield around 715 pm edt. 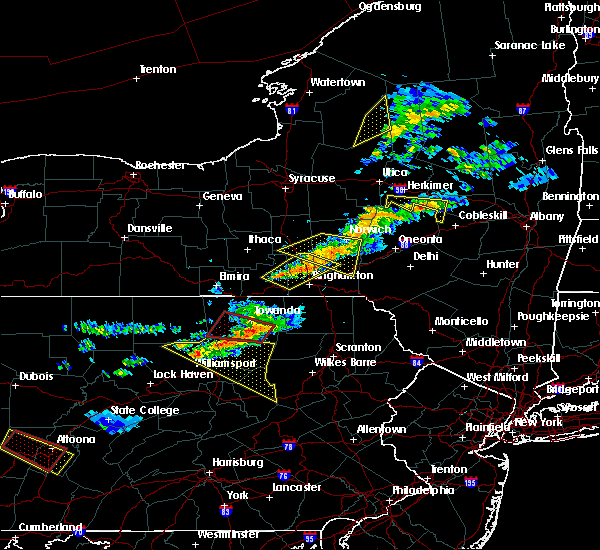 binghamton, richfield springs and mt upton around 720 pm edt. hartwick, morris and gilbertsville around 725 pm edt. a tornado watch remains in effect until 1000 pm edt for oneida county in central new york. 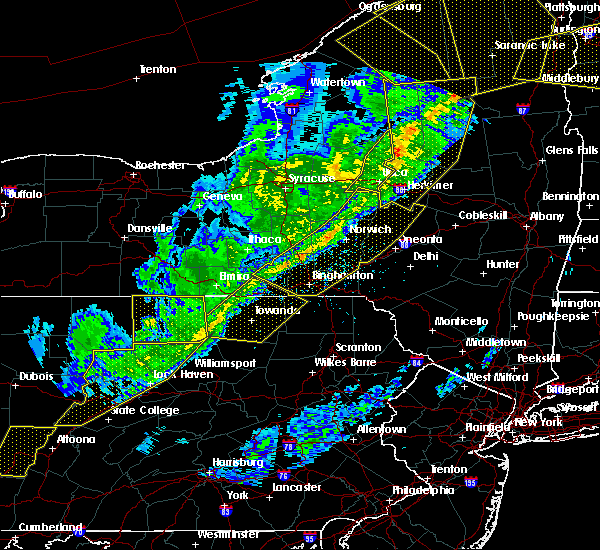 A severe thunderstorm watch remains in effect until 900 pm edt for the remainder of central new york. 5/4/2018 6:27 PM EDT At 627 pm edt, severe thunderstorms were located along a line extending from near sherrill to near erieville to near truxton to near danby, moving southeast at 40 mph (radar indicated). Hazards include 60 mph wind gusts. Expect damage to trees, and power lines. severe thunderstorms will be near, oneida, sherrill and nelson around 630 pm edt. morrisville, stockbridge and georgetown around 635 pm edt. hamilton, augusta and lebanon around 640 pm edt. 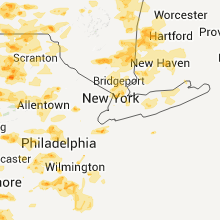 clinton, candor and pecksport around 645 pm edt. waterville, berkshire and earlville around 650 pm edt. owego, plymouth and sherburne around 655 pm edt. brookfield, north norwich and nanticoke around 700 pm edt. norwich, oxford and columbus around 705 pm edt. A tornado watch remains in effect until 1000 pm edt for central new york. 5/3/2018 4:28 PM EDT The severe thunderstorm warning for broome, southwestern chenango and northern susquehanna counties will expire at 430 pm edt, the thunderstorms which prompted the warning have weakened below severe limits, and no longer poses an immediate threat to life or property. therefore, the warning will be allowed to expire. however, gusty winds of 35 to 40 mph will still be possible with this cluster of thunderstorms. additional statements will be issued as conditions warrant. 5/3/2018 4:08 PM EDT At 405 pm edt, a cluster of severe thunderstorms was located over endicott, moving east at 45 mph (radar indicated). Hazards include 60 mph wind gusts. Expect damage to trees, and power lines. Locations impacted include, binghamton, vestal, johnson city, endicott, kirkwood, conklin, maine, sanford, nanticoke and deposit. 5/3/2018 3:43 PM EDT At 342 pm edt, severe thunderstorms were located along a line extending from near spencer to near lockwood to barton, moving east at 50 mph (radar indicated). Hazards include 60 mph wind gusts. Expect damage to trees, and power lines. Locations impacted include, binghamton, vestal, johnson city, endicott, barton, sayre, maine, waverly, owego and nanticoke. 5/3/2018 3:35 PM EDT At 334 pm edt, severe thunderstorms were located along a line extending from near van etten to lockwood to near waverly, moving east at 50 mph (radar indicated). Hazards include 60 mph wind gusts. Expect damage to trees, and power lines. Locations impacted include, binghamton, vestal, johnson city, endicott, barton, sayre, maine, waverly, owego and erin. 8/4/2017 5:01 PM EDT At 501 pm edt, a severe thunderstorm was located over le raysville, or 14 miles north of wyalusing, moving north at 55 mph (radar indicated). Hazards include 60 mph wind gusts. Expect damage to trees, and power lines. this severe thunderstorm will be near, windham, friendsville and warren center around 505 pm edt. little meadows around 510 pm edt. tioga terrace and vestal center around 515 pm edt. endicott, vestal and west corners around 520 pm edt. johnson city, union center and endwell around 525 pm edt. Nws binghamton, newark valley and castle creek around 530 pm edt. 7/17/2017 4:18 PM EDT At 416 pm edt, a severe thunderstorm was located near kirkwood, or near binghamton, moving east at 20 mph (radar indicated). Hazards include 60 mph wind gusts and quarter size hail. Minor hail damage to vehicles is possible. expect wind to cause damage to trees, and power lines. This severe storm will be near, windsor and harpursville around 430 pm edt. 7/17/2017 3:43 PM EDT At 342 pm edt, a severe thunderstorm was located over vestal center, or near endicott, moving east at 20 mph (radar indicated). Hazards include 60 mph wind gusts and quarter size hail. Minor hail damage to vehicles is possible. expect wind to cause damage to trees, and power lines. this severe thunderstorm will be near, johnson city and brackney around 355 pm edt. binghamton around 405 pm edt. conklin and chenango bridge around 410 pm edt. kirkwood around 415 pm edt. sanitaria spgs around 425 pm edt. Windsor and harpursville around 430 pm edt. 7/17/2017 2:50 PM EDT At 250 pm edt, a severe thunderstorm was located near union center, or near endicott, moving northeast at 10 mph (radar indicated). Hazards include 60 mph wind gusts and quarter size hail. Minor hail damage to vehicles is possible. expect wind to cause damage to trees, and power lines. 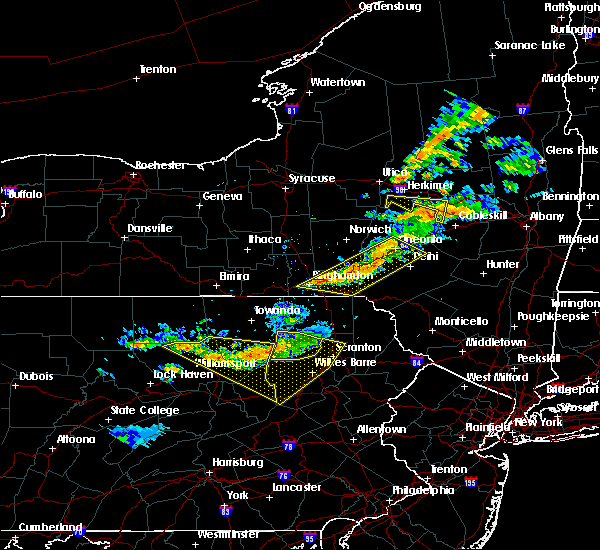 this severe thunderstorm will be near, vestal around 300 pm edt. west corners around 305 pm edt. endicott and union center around 310 pm edt. endwell around 320 pm edt. johnson city around 330 pm edt. nanticoke around 335 pm edt. 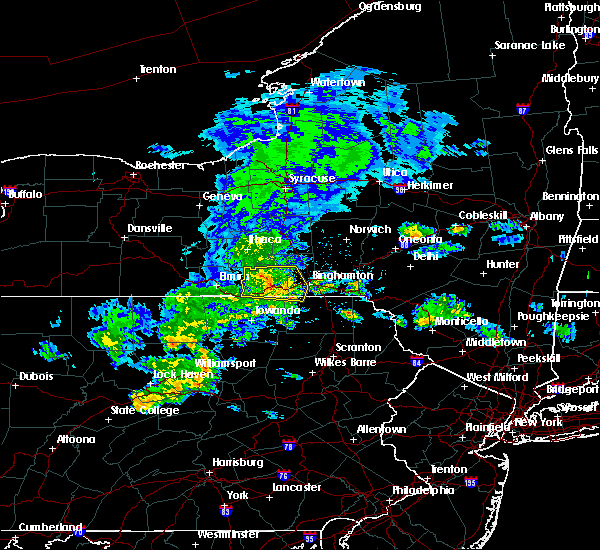 nws binghamton around 340 pm edt. Binghamton, whitney point and castle creek around 345 pm edt. 6/19/2017 12:40 PM EDT At 1239 pm edt, a severe thunderstorm was located over litchfield, or near athens, moving northeast at 45 mph (radar indicated). Hazards include 60 mph wind gusts. Expect damage to trees, and power lines. this severe thunderstorm will be near, windham around 1245 pm edt. lounsberry and tioga center around 1250 pm edt. owego and little meadows around 1255 pm edt. apalachin and tioga terrace around 100 pm edt. vestal and vestal center around 105 pm edt. endicott, endwell and west corners around 110 pm edt. 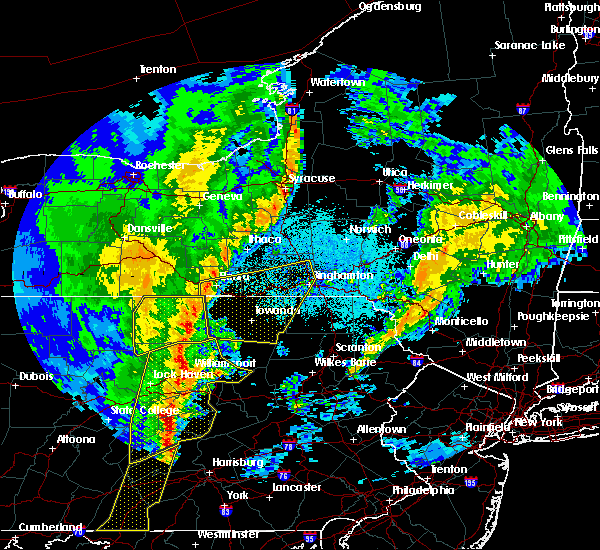 johnson city and nws binghamton around 115 pm edt. Binghamton around 120 pm edt. 6/18/2017 8:08 PM EDT At 808 pm edt, severe thunderstorms were located along a line extending from near spencer to near lockwood to litchfield to ulster, moving east at 35 mph (radar indicated). Hazards include 60 mph wind gusts. Expect damage to trees, and power lines. severe thunderstorms will be near, south danby around 815 pm edt. owego, candor and nichols around 820 pm edt. lounsberry around 825 pm edt. windham around 830 pm edt. newark valley and le raysville around 835 pm edt. berkshire, richford and warren center around 840 pm edt. vestal, nanticoke and little meadows around 845 pm edt. Endicott, nws binghamton and friendsville around 850 pm edt. 5/1/2017 7:38 PM EDT At 737 pm edt, severe thunderstorms were located along a line extending from near hamilton to pitcher to near richford to near owego to wysox, moving east at 30 to 40 mph (radar indicated). Hazards include 60 mph wind gusts and penny size hail. Expect damage to roofs, siding, and trees. these severe storms will be near, hamilton, lebanon and cincinnatus around 740 pm edt. earlville around 745 pm edt. lisle, poolville and mc donough around 750 pm edt. whitney point, le raysville and endwell around 755 pm edt. 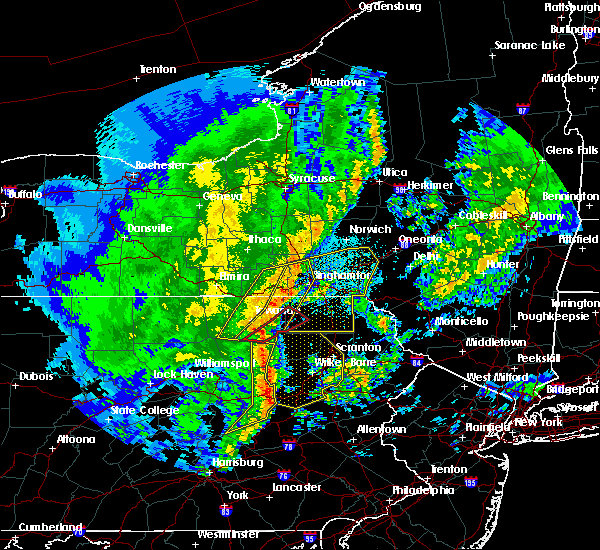 johnson city, nws binghamton and brushville around 800 pm edt. binghamton, brookfield and plymouth around 810 pm edt. norwich, kirkwood and conklin around 815 pm edt. 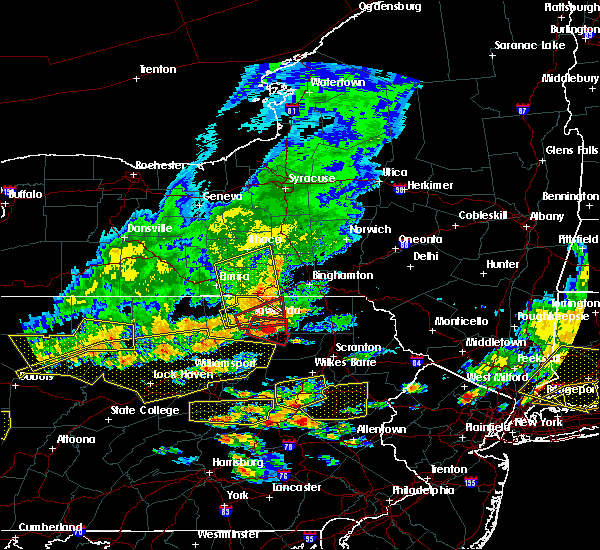 A tornado watch remains in effect until 1000 pm edt for central new york, and northeastern pennsylvania. 5/1/2017 7:14 PM EDT At 713 pm edt, severe thunderstorms were located along a line extending from cuyler to near virgil to willseyville to barton to near burlington, moving northeast at 40 mph (radar indicated). Hazards include 60 mph wind gusts and penny size hail. Expect damage to roofs, siding, and trees. severe thunderstorms will be near, mcgraw, cuyler and de ruyter around 720 pm edt. solon around 725 pm edt. towanda, berkshire and richford around 730 pm edt. wysox, lebanon and cincinnatus around 735 pm edt. 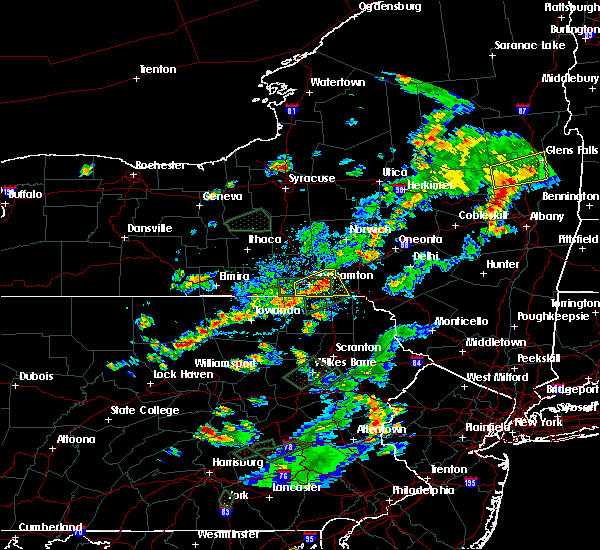 litchfield, newark valley and rome around 740 pm edt. endicott, hamilton and marathon around 745 pm edt. 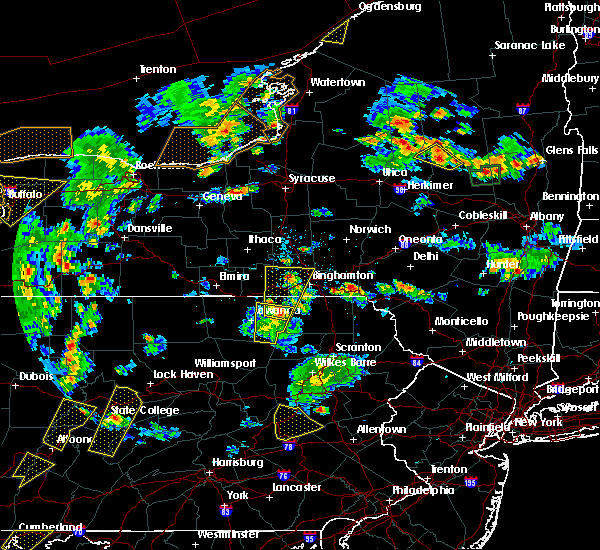 johnson city, nws binghamton and nanticoke around 750 pm edt. 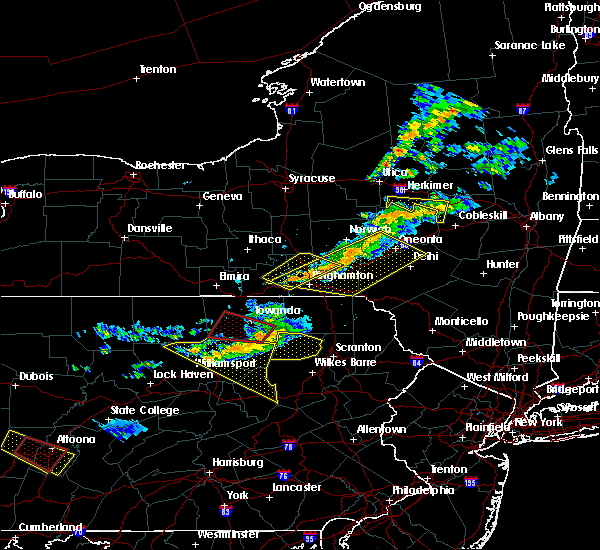 binghamton, plymouth and otselic around 755 pm edt. 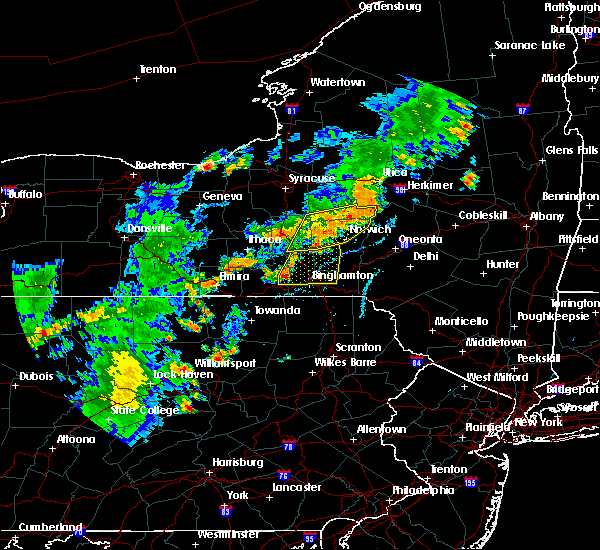 A tornado watch remains in effect until 1000 pm edt for central new york, and northeastern pennsylvania. 4/16/2017 4:49 PM EDT At 448 pm edt, severe thunderstorms were located along a line extending from near sidney to near windsor to conklin, moving east at 55 mph (radar indicated). Hazards include 60 mph wind gusts. Expect damage to trees. 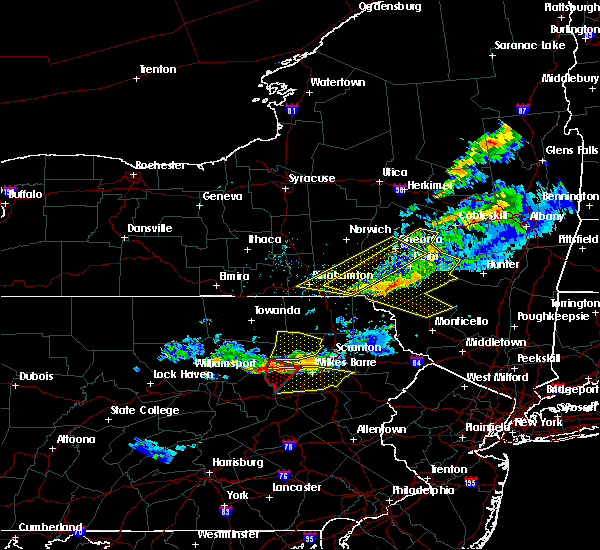 these severe storms will be near, deposit around 500 pm edt. Walton and colchester around 505 pm edt. 4/16/2017 4:36 PM EDT At 436 pm edt, severe thunderstorms were located along a line extending from coventry to chenango bridge to vestal, moving east at 45 mph (radar indicated). Hazards include 60 mph wind gusts. Expect damage to trees. 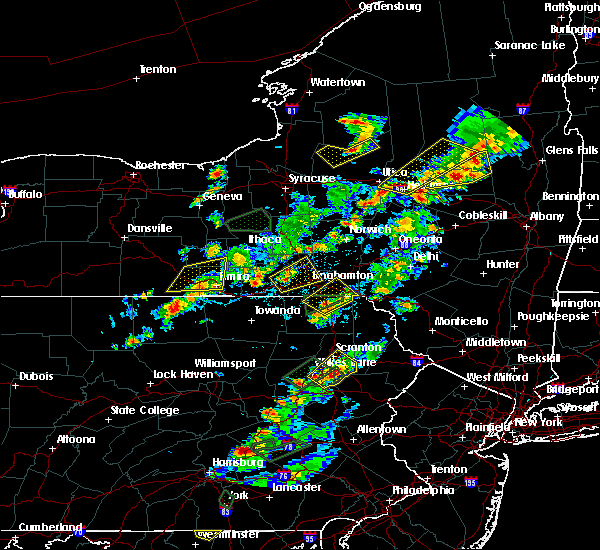 severe thunderstorms will be near, coventry around 440 pm edt. bainbridge, afton and sanitaria spgs around 445 pm edt. sidney around 450 pm edt. kirkwood, conklin and windsor around 455 pm edt. sanford around 505 pm edt. walton and deposit around 510 pm edt. Colchester around 515 pm edt. 7/25/2016 3:20 PM EDT At 320 pm edt, a severe thunderstorm was located over newark valley, or 9 miles northeast of owego, moving east at 35 mph (radar indicated). Hazards include 60 mph wind gusts. Expect damage to roofs. siding. and trees. this severe thunderstorm will be near, nanticoke and union center around 330 pm edt. endicott, greater binghamton airport and vestal around 335 pm edt. johnson city around 340 pm edt. castle creek and chenango forks around 345 pm edt. Binghamton and chenango bridge around 350 pm edt. 7/26/2015 4:28 PM EDT At 428 pm edt, a severe thunderstorm was located near union center, or near endicott, moving northeast at 25 mph (radar indicated). Hazards include 60 mph wind gusts and quarter size hail. Hail damage to vehicles is expected. expect wind damage to roofs, siding and trees. this severe thunderstorm will be near, endwell around 435 pm edt. johnson city around 440 pm edt. greater binghamton airport and nanticoke around 445 pm edt. whitney point, castle creek and chenango bridge around 455 pm edt. Chenango forks around 500 pm edt. 6/12/2015 7:36 PM EDT At 735 pm edt, a severe thunderstorm was located over newark valley, or 7 miles west of greater binghamton airport, moving east at 40 mph (radar indicated). Hazards include 60 mph wind gusts. Expect damage to roofs. siding and trees. this severe thunderstorm will be near, endicott, union center and west corners around 745 pm edt. johnson city, greater binghamton airport and castle creek around 750 pm edt. chenango forks around 755 pm edt. binghamton and chenango bridge around 800 pm edt. sanitaria springs around 805 pm edt. conklin around 810 pm edt. Harpursville and nineveh around 815 pm edt. 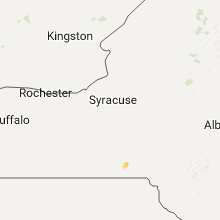 6/12/2015 7:36 PM EDT The national weather service in binghamton has issued a * severe thunderstorm warning for. eastern tioga county in central new york. southeastern cortland county in central new york. southwestern chenango county in central new york. 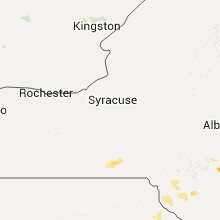 Broome county in central new york. 5/18/2015 6:13 PM EDT At 613 pm edt, a severe thunderstorm was located over greater binghamton airport, moving east at 25 mph (radar indicated). Hazards include 60 mph wind gusts and quarter size hail. Hail damage to vehicles is expected. expect wind damage to roofs, siding and trees. this severe thunderstorm will be near, castle creek and chenango bridge around 625 pm edt. chenango forks around 630 pm edt. sanitaria springs around 640 pm edt. greene around 645 pm edt. 1. 00in. 5/18/2015 5:51 PM EDT At 550 pm edt, a severe thunderstorm was located over tioga terrace, or near endicott, moving east at 30 mph (radar indicated). Hazards include 60 mph wind gusts and quarter size hail. Hail damage to vehicles is expected. expect wind damage to roofs, siding and trees. this severe thunderstorm will be near, endicott, vestal and west corners around 600 pm edt. endwell around 605 pm edt. 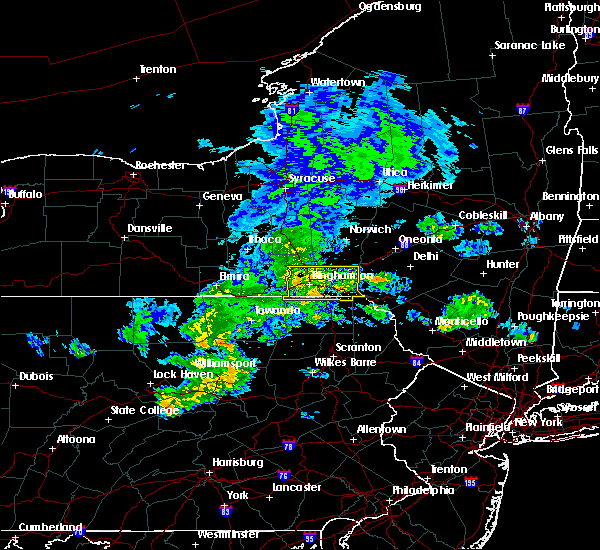 johnson city and greater binghamton airport around 610 pm edt. binghamton, chenango bridge and castle creek around 615 pm edt. 1. 00in.